The following tests outlined below may be extremely helpful for both tailoring your program and to chart your progress. Tests that help to diagnose metal and chemical toxicity include blood tests, urine tests, and the analysis of hair, nails or other tissues. The most accurate of these are a chelation challenge test, or a hair tissue mineral analysis. Regular blood tests and urine tests are not accurate in diagnosing heavy metal toxicity, as they only tend to show what is happening in the body in a brief moment in time, and do not give the long-term picture. This makes sense since the body works hard to keep the levels of nutrients in the bloodstream within fairly tight limits. If large fluctuations in mineral levels occurred, serious illness or even death would result. A tissue mineral analysis or hair analysis provides a unique reading of heavy metal and mineral levels in the cells over a two to three month period. It takes into consideration that toxins are stored in the tissues of the body, not in the blood. For instance, you can have normal copper levels in the blood, but high copper levels in the tissues. VAXA® pH Test Strips™ are an accurate and convenient way to measure the body's pH. The easiest way to measure the body's pH is to measure the first mornings urination with a test strip. It has been clinically established that the urine pH is an accurate reflection of the whole body tissue pH. The urine pH directly correlates to both oxygen levels and soft tissue levels of minerals such as calcium, magnesium, and trace elements. The best time to measure tissue pH is your first urination of the morning. More specifically, the first urination after 5 AM. Simply take a plastic cup or small clean container and fill it with urine. Then take a test strip and test it with the pH of the fluid in the container. You should immediately see a change in color which you can then match against the color of the chart given in the test kit. When you check your first urine pH in the morning, your pH should be between 6.4 and 7.0. If the first morning urine pH is acidic (a pH below 6.4), this indicates the body is in a state of physiological disregulation due to lack of sufficient minerals which are needed to properly carry out thousands of basic cellular functions. A lack of sufficient minerals is almost always indicative of heavy metal toxins within thebody, which bind up the receptor sites so that minerals cannot be absorbed. Therefore, the immediate goal is to restore a consistent alkaline first morning urine pH by detoxifying the body of heavy metals and chemicals, and by taking alkalizing supplements. First thing in the morning, before you put ANYTHING in your mouth, get a clear glass of water. Work up a bit of saliva, and then spit into the water. Check the water every 15 minutes or so for up to an hour. 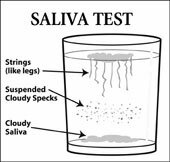 If you have a problem with candida yeast overgrowth, you will see strings (like legs) traveling down into the water from the saliva floating on the top, or "cloudy" saliva will sink to the bottom of the glass, or cloudy specks will seem to be suspended in the water. If there are no strings and the candida is still floating after one hour, you probably have candida under control. While using a good antifungal, you can continue to test yourself. You will start to see fewer and fewer "strings" hanging down. IMPORTANT TIP: If you have been diagnosed with ALS, you should be tested for Lyme Disease. There have been cases of people being misdiagnosed with ALS, when in fact they had Lyme disease. It is essential to find a doctor who is an expert in Lyme Disease. To find a doctor in your area who is "Lyme literate", call the Lyme Disease's toll-free number at 888-366-6611. They are a non-profit organization that provides information about Lyme and its treatment, and referral to doctors in various areas of the US. They also have a wealth of information on their website at www.lymediseaseassociation.org. Another excellent web site for information on the disease is that of the International Lyme and Associated Diseases Society at www.ilads.org. The PLT blood test also known as the platelet blood test is done to count how many blood platelets there are in our blood. Visit our report on Diet for Neurological Health. Thank you for visiting our page on Tests for ALS!